Are you new to traveling on road trips with your small dog? I have been there before too. After a few long road trips, I finally started to get the hang of traveling with dogs. I have listed tips and products that have worked for me and I hope they will help you as well. One of my dogs travels great and is content to go anywhere in the car. My other dog has terrible anxiety at stop lights and around town. However, he does fine once we get on the interstate. If you have an anxious dog, scroll down to the last heading to see a few tips for coping with dog anxiety on the road. Many of these tips work for all dog sizes, not just on road trips with small dogs. 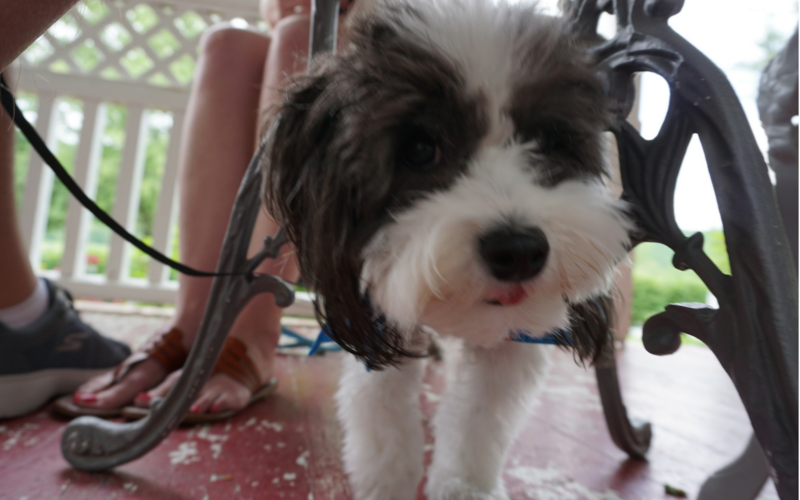 I just chose to focus on small dogs since that’s what I am familiar with. If you have additional tips, please leave them in the comments. I would love to hear suggestions! 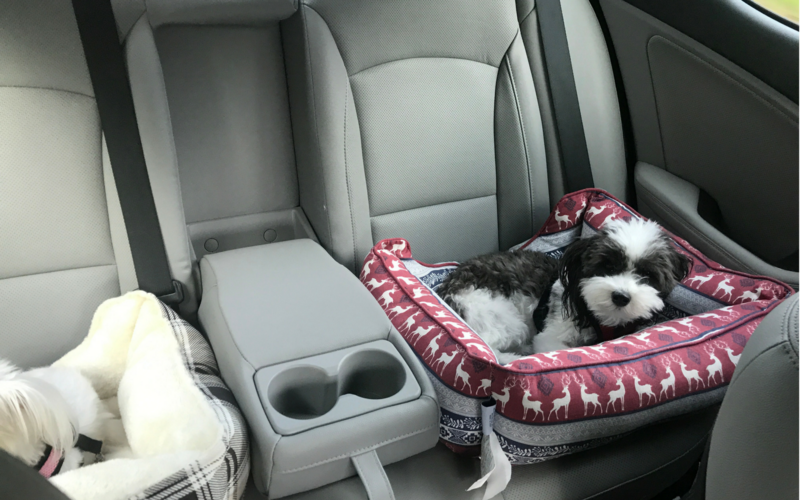 Car Booster Seat, Seatbelt Strap or Other Safety Barrier: Car seats are so important for traveling with small dogs because the seats help secure small dogs on the road. 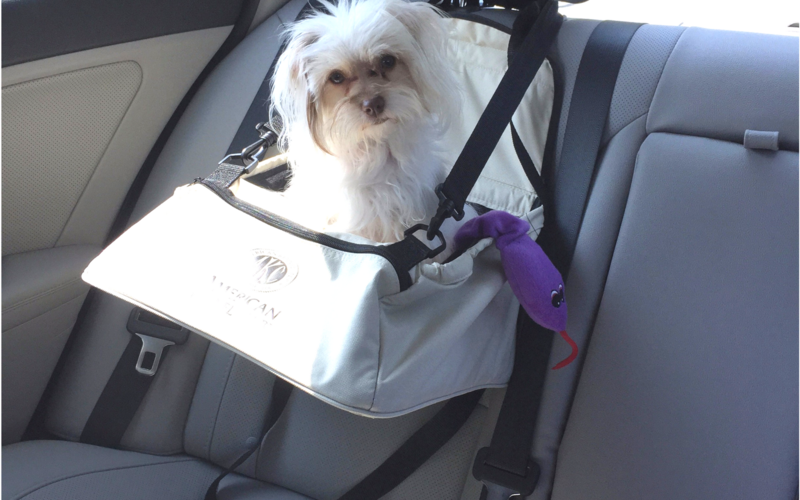 Pet Car Booster Seat: My recommendation for small dogs is a booster seat. Booster seats allow dogs to see out of the car window while keeping them safe. Dog Safety Seat Belts: I absolutely love these! Not only are they super affordable in packs of two, they are also insanely easy to pack. Car Seat Hammock for Dogs: Another option for keeping your dog safer in the car while protecting your seats. Collapsible Travel Water Bowl: This travel bowl is 100% BPA-free, lead-free and made of high-quality food-grade silicone. 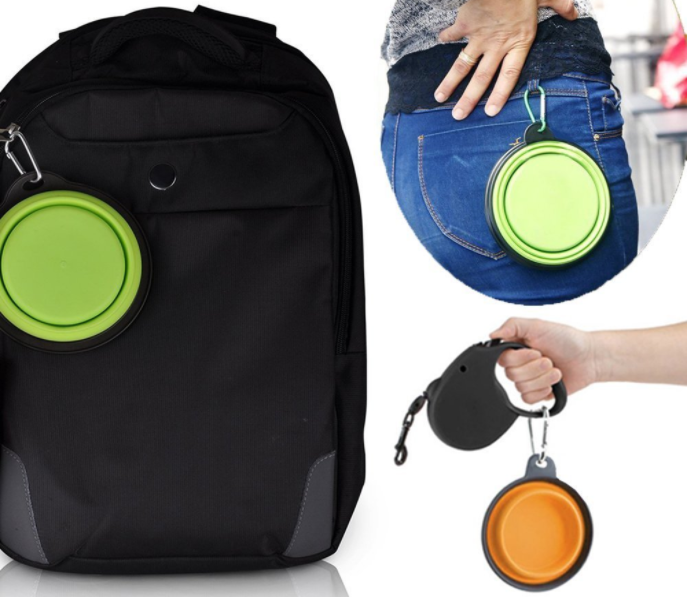 Cooler or Insulated Lunch Bag: Keep water bottles cool on long trips this way. Towel: Packing a towel for the backseat might just be the most versatile packing move you make. From unexpected spills to drying off your dog after unforeseen rain, towels help prepare for the worst! Ziploc Bags: Another versatile item for the packing list! If your small dogs are anything like mine, they will sometimes only halfway finish treats, so having a storage bag is nice for this. You can store other items in Ziploc bags to easily transfer essentials from the car to the hotel room, and more. Put a dog bed in the seats if you will be traveling at night: Make your back seat comfy by tossing dog beds in the back. Put beds on top of a seat hammock for extra safety. Dog Bed: The dog bed you have at home will likely work fine or there are tons of other options on Amazon. If your dog is super tiny, a cat bed works great too! Seat Hammock: As mentioned above, this is a great way to keep your seats protected and keep dogs safer in the backseat when in their beds. Doggie Bags: Pack dog bags to clean up after your pet in case stops do not have dog waste bags. 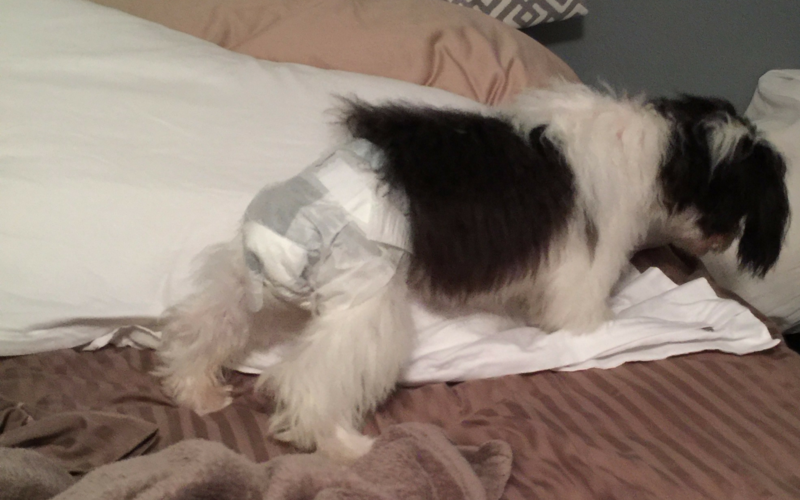 Pack dog diapers as a backup if your pup is used to a pee pad: If your dog refuses to go outside or away from home, you can try laying a pee pad down on the grass in a non-crowded spot. If this doesn’t work, you may want to have your dog wear a dog diaper in case of accidents in the car. Disposable Dog Diapers: These come in packs of 12 and are good if you are just trying out dog diapers or for trips since they can be thrown out. 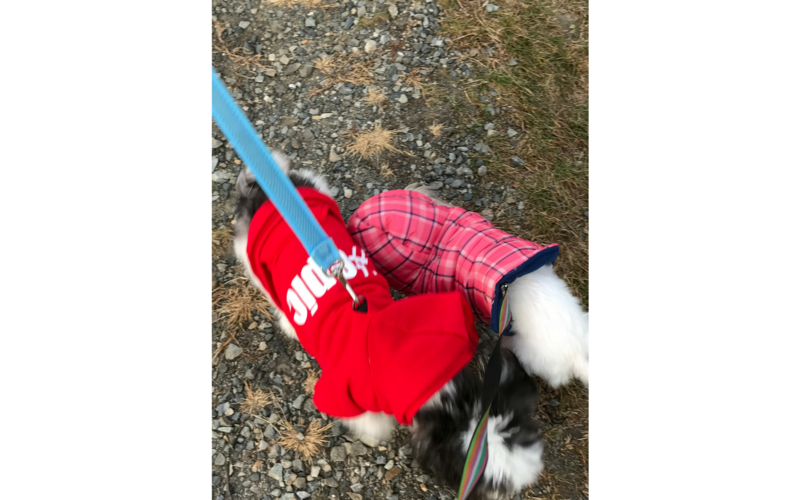 Reusable Dog Diapers: After paying for pricey disposable diapers, I invested in reusable ones and loved them! They worked much better in my opinion. Dog Safe Wet Wipes: Muddy paws, slobber and more can be easily touched up with wipes. These are so handy! You can also keep wet paper towels in a Ziploc bag in the cooler or make some (see here). Pack Peanut Butter or Honey for long trips: If you are headed out on a long road trip, make sure you have something your dog can lap up in small amounts on the road to avoid blood sugar drops. This was a tip from the rescue center where I adopted my youngest dog. We drove 7 hours to get her so we had a long drive and I was so happy to have honey since my dog refused to eat on the trip. Be careful not to give your dog to much (I only gave mine a teaspoon) and check with your vet first. Always travel with your dog’s health records: Even if you are not driving out of the country, traveling with copies of your dog’s health papers is a good idea. You never know when you want to check out a doggie spa after a muddy walk, and papers are typically required. Map out dog friendly restaurants before you head out or pack food: I recommend packing a cooler with lunches or at least snacks and drinks in case you are not close to pet friendly places. Make sure you save dog friendly options to your phone so your route is less stressful. Have everything you need handy close by (not in trunk): When I was a new dog owner, I made the mistake of packing the dog stuff in the trunk. I was on the interstate when I realized I needed something from the dog bag and far off from any stops. Keep essentials handy in a smaller bag in the front of the car to prevent being out of reach. Be prepared for all weather: Be prepared with an umbrella and jackets for you and your dog(s) in case you have to get out in the rain. Prevent anxiety at red lights while providing shade with these window covers: I may be the only person on earth, but does anyone else’s dog freak out at red lights and stop signs? Cover the windows with shades if anxiety is really bad. Make sure to measure your windows first to find the correct fit for your car. Thunder shirt: If bumpiness of the road makes your dog feel uneasy, Stress Relief Shirts may help. 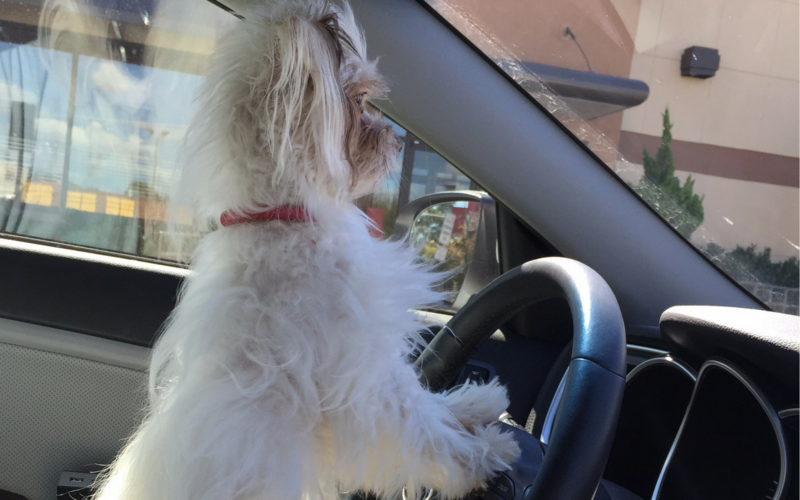 Download a dog playlist for the road: Spotify has a great playlist for dogs which really helps my pups when we are at stops waiting in the car. Just search for “Dog Calming Music” and download it to your phone so you can always listen, even when you are out of signal zones. Any classical or nature soundtracks should work too. Calming Spray: Spray this calming spray on pet beds or on a bandana your pup can wear to provide relief. You can also spritz a couple of splashes on a blanket from home and keep it in the backseat with your dog. Calming Chews: These are not miracle workers, but they seem to make some difference. I feel like with an anxious dog, the best strategy is a combination of tricks! No method is perfect alone. Keep a Ziploc bag of high value treats: This comes in handy to have close by as a distraction for stressful times. If we are about to stop next to a motorcycle or people who are staring at the dogs, I already know my dog will be triggered. I try to be aware of what’s ahead and then immediately before coming to the trigger, I give my dog a high value treat to distract him. Hopefully, this changes the scary association to a positive one. One can hope! I hope you find these tips useful! Feel free to leave a comment if you have any ideas.